Garden catalogs began to show up in early January and will continue a while. There may be plenty of phrases and initials that you know. There are some new ones now too. 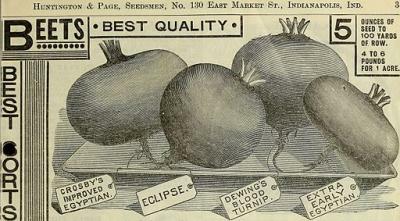 Vegetable descriptions will often include a number of initials at the end. These usually signify that the vegetable has been bred with disease resistance or tolerance to a disease specific to that variety. A tomato for example may have several initials V, F, N, TMV for resistance to Verticillium and Fusarium wilt, Nematode resistance and Tobacco Mosaic Virus. Cucumbers can wear the initials CMV, CVYV and PM. These stand for Cucumber Mosaic Virus, Cucumber Vein Yellowing Virus, Powdery Mildew and a new one in the last couple of years, DM for Downy Mildew. Just about every improved hybrid variety of vegetable will carry some level of disease resistance. A new disease to Basil, an easy to grow herb in the past, now has issues with Downy Mildew. This is a different strain than the one on cucumber and so far the best we have is an intermediate resistance to DM for some varieties, so read carefully. Another term frequently used to promote a variety is the designation F1. This means that this variety is a first generation cross by two known parent plants and contains the best genes from both the male and female plants. This F1 hybrid can be a better performer, providing a higher yield, have more disease resistance or tolerant than either parent. Vegetables, just like flowers can have the AAS designation. The All-America Selection designation signifies that this variety has performed to a high set of standards to ensure it will perform in your yard. Testing and evaluation occur in a number of locations throughout the United States so you can be comfortable knowing that you can purchase the seed or a transplant at the garden center and have a quality plant. There is a growing trend to purchase what is known as heirloom or antique or open pollinated vegetables. These vegetables can provide fruit with a lot of visual character and when eaten different texture and flavor. If you have problems in the garden with diseases and in particular the soil diseases, it is best to stick with the hybrids since you cannot treat for these diseases and save your plants. If you are a flower gardener, similar terminology exists for perennials. If phlox is on your shopping list, see if you can find one that indicates a resistance to powdery mildew. If roses are your thing, then look for resistance to black spot and powdery mildew. If you are shopping for dwarf apple trees, apple scab and cedar apple rust are two diseases you would want resistance to. Starting this early allows you to plan out the garden, figure out the varieties you will need to order from the catalogs and what will be at your favorite garden center. Planning ahead also allows for choosing those varieties that will fit in the space you have, especially the vegetable garden. The catalogs will again help you with additional information. Vine crops will be listed as a "bush type" meaning the plant will not vine out but rather stay compact. Tomato plants can be either indeterminate or determinate types. Determinate varieties limit their size while still producing tomatoes, while indeterminate varieties will just continue to grow in size while the produce fruits all summer. By understanding the descriptions in any catalog, you get to make the best selection possible for your garden.